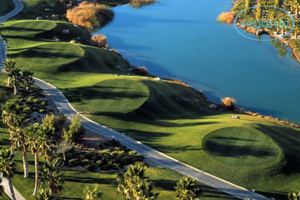 Las Vegas is home to several Golf Clubs and courses, but nothing compares to the intricately landscaped, Rhodes Ranch Golf Club. This club has a traditional resort style layout and was specially designed by Architect Ted Robinson. Beautifully designed and uniquely detailed, the course will not ever leave you disappointed. 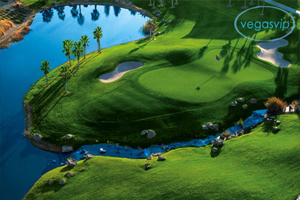 Rhodes Ranch is 6,909 yards and with the plush tropical landscaping, the golfers from any skill level, professional or not, can enjoy a truly comfortable, relaxed and serene game of golf. Regardless what your intentions are for play that day, green fees can be as low as eighty five dollars! Sometimes twenty five dollars if playing after 3:30pm! Contact the club for more details. Known for their signature hole par three, number three, the course is not just challenging and complex but with the tranquility of the waterfall that flows majestically into a lake, you are challenged from the moment of tee off. Yet even in its diversity, Rhodes Ranch Golf Club has somehow managed to do their part in water conservation by surfacing all the green with Tiff Dwarf Bermuda which is a better drought-tolerant grass which will help protect and maintain to give continuous years of play. Golfing is not the only highlighted feature that this amazing club has to offer. Elaborate and elite one of a kind weddings bring so much magic to the husband and wife to be by combining dream like sunsets and intricate rich city views with family, friends and champagne. Mixed together this brings a magical union that will always be completely memorable. Rhodes Ranch offers a romantic lakeside ceremony under canopied tropical palm trees and plush intoxicating green grass. There is both indoor and outdoor patio seating and their Frank Lloyd Wright inspired clubhouse gives a great location for amazing photos and reception. What an ideal spot for a couple to begin their new life together! If you are looking for just a great meal in a great atmosphere then why not take a break from yet another monotonous day and stop by the restaurant where you can enjoy high quality flat screen TV's, and some of the best burgers in town? The food is delicious, the staff is amazing and the aura is one of a kind. The energy level displayed in the Rhodes Ranch Bar is almost incomparable. This bar is always energetic and lively, with a complete cocktail and beer selection to choose from. This upbeat atmosphere is a great way to bring an ending to an already amazing day. Relax after your competitive play and know that there's nothing wrong with a little bit of pampering! One of the best parts about this club is that the green fees include two draft beers and one bottled water, so why not stop by?